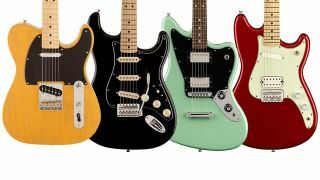 While we’ve seen plenty of deals on individual guitars, we’re particularly excited to see Fender’s Special Edition Deluxe and Standard models receiving solid reductions across the board. Musician’s Friend is slashing $100 off eight Special Edition models, including the Deluxe Ash Telecaster, Deluxe PJ Bass, Standard Stratocaster, Standard Stratocaster HSS, Standard Telecaster HH, Duo-Sonic HS, Standard Jaguar HH and Deluxe Telecaster. Prices now go as low as $399 for the Duo-Sonic HS, rising to $799 for the Deluxe PJ Bass. What’s more, there’s also $100 off the Limited Edition American Professional Offset Telecaster, and $200 off the Classic ’69 Blue Flower Telecaster. And if you needed yet more incentive, many of these models appear in limited-edition finishes, which you’re unlikely to find once stocks run out. So get to it!